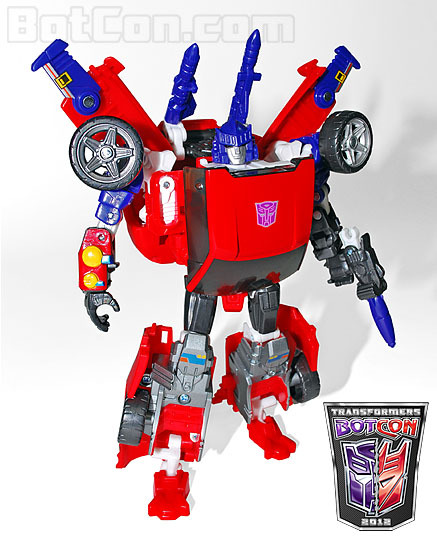 So, time to talk about the next figure that was announced to be in the Botcon 2012 boxset. Aside: This was gonna be a discussion of the next two. But then as it turns out I had a LOT to say about this one. So yeah. Soundwave is one of those characters who has had some….well, interesting, feedback. 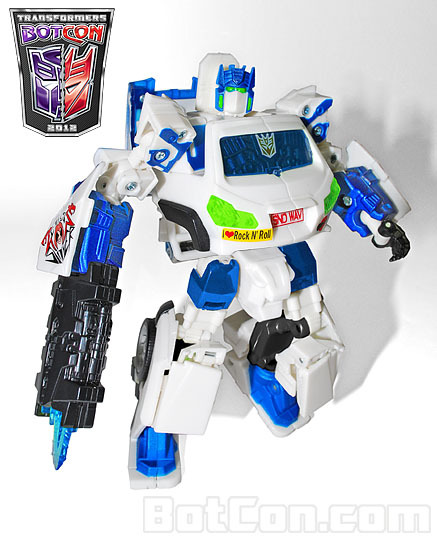 Back in the Botcon 2008 Shattered Glass comic, he turned up as a repurposed version of the “Sonic White” Music Label Soundwave figures, which was white save for blue head/highlights here and there. Which worked at the time, and probably gave a few people incentive to actually buy that deco. But then they changed it up in the next year – as a prequel of sorts to the 2009 club comics, which revisited the Shattered Glass universe, Soundwave turned up and got character development – and a new alternate form on Earth. Namely, he now turned into a music van (specifically, a van for the Shattered Glass version of Cold Slither, a Cobra musical group from the GI Joe cartoon), made a bandana from a nearby flag, and was quickly established as an awesome kickass groovy heroic Decepticon. He got a lot of development in the prose stories, and was even knighted – thus the “Sir” I appended to his name earlier. However, this new design? It used the Universe Ironhide mold. Where to begin about that? Well, the Ironhide mold has a number of flaws, including an odd backpack and a head that is permanently looking down due to poor design. So naturally, fans were somewhat upset when it turned out that, surprise surprise, he’s using the toy they gave him in the comics back in 2009, as back then, honestly, it WAS a decent enough fit for the character given a)music van and b) Soundwave style chest. However, going off the pics, it appears that Botcon has actually gone and, in designing the new head, compensated for this looking down drawback. All good, right? Not quite…. honestly, I’m not sure on the height of the faceplate. It feels more like an Optimus Prime head and less a Soundwave head due to how tall the faceplate is. Is this nitpicky? Hell yes it is, but it is sorta true as well. The other major complaint people had about the head was, well, what wasn’t there. Namely, the headband bandana he’s had in every appearance since getting this altmode, including in the Botcon promo art itself. Here is where PR stuff sorta went to hell, largely because people were expecting the bandana due to it being in the art, and Pete Sinclair of the TCC sought to alleviate people by informing them they could buy the bandana at the con. Now, they had valid reasons for making this choice. The list Pete gave online makes sense to me. Namely, Fun Pub appears to be making them themselves, rather than farming them out to the Chinese factory. But it still rubs me the wrong way that in order to have a complete Soundwave, you’re going to have to PAY for a little yellow headband accessory to complete his canon look. In the long run, it would have probably been a better idea to just drop the headband in the promoart/story altogether, and Pete himself admitted this, so that said I suppose I should give them kudos for trying to go the extra mile, at the very least. Besides, odds are if the factory was doing the headband, they’d muck it up in the same way that Nightbeat’s antennae and Punch/Counterpunch’s head size were mucked up without informing the Fun Pub folks until the deed was done. And like they sorta did with G2 Ramjet as the factory did an unplanned remold to give him a rubber nosecone. So, with registration having now gone up today for Botcon 2012, we’ve finally gotten a glance at all the plastic goodies that will be in the 2012 boxset. Albeit, in crappy thumbnail form, save for the four figures who already got complete reveals. So, that said, as someone who hasn’t gone to Botcon, yet owns most of 2010’s set and all of 2011’s exclusives (save for the customizing class figure), what dost I think of the reveals we’ve had so far? …well, first of all, WOW that’s a lot of blues and reds. Seriously, Ultra Magnus, Metalhawk, and Tracks all are pretty much exclusively red and blue, which adds a fairly…. well, to put it frankly, the set feels a little TOO unified in colorscheme as a result, albeit unintentionally. Gigatron’s an interesting duck in that he’s, well, completely not what I expected the mold to be. Overlord is a character I picture as tall, imposing, bulky but streamlined in a boxy way. And awesome, as Nick Roche and James Roberts made him in the “Last Stand of the Wreckers” mini. So him being the Bludgeon mold threw me, given it didn’t fit whatsoever my image of what Overlord should be. It was too small, too bulky, and Overlord was nothing like a samurai whatsoever! And thus the Nick Roche-lips head they stuck on, though not a bad remold, seemed out of place. Then people started pointing out that Giga, the Japanese Powermaster from who the name “Gigatron” is derived (as you can’t easily trademark Overlord) was very samurai in appearance. Suddenly, this started fitting a little better, and once I cleared out the expectation that I would be getting the badass LSOTW Overlord in this set, and instead a new interpretation of the character, I found myself warming up to what is admittedly a fairly solid mold. Shattered Glass is a contentious theme among Transformers fans – some love it, some hate it. The idea of alternate mirror universe Transformers is a neat one for a set, but honestly? 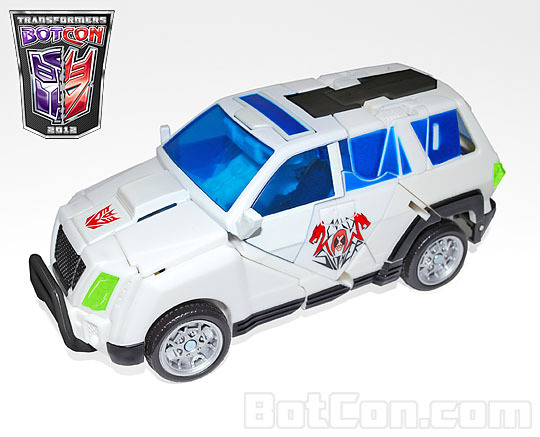 I think Botcon’s a bit too in love with the concept, given how every year since 2008 has had at least one Shattered Glass exclusive available at Botcon. (Plus, 2009 and 2012 both have SG exclusives through the club itself). That said, Tracks is a nice looking homage to Road Rage – the name retroactively assigned to the original Diaclone-era deco of the toy that would become Tracks upon his release in North America by Hasbro. Altmode is gorgeous – he’s a nice looking red car. But then we have robot mode. Where his head/arms/missiles are blue. And honestly? For me, the contrast seemed, well, out of place. Red/Blue is something that can look garish, and not in an awesome way like the insanely, cranked-up-to-11 garish decoes of Generation 2 era toys. No, this is something that just naturally seems to clash, and as such, despite it being a solid deco, toy, and homage, I’m not enthused by this figure. More Botcon toy musings and thoughts to come in the next update!